Toshiba was the ﬁrst company to release a laptop over 20 years ago and has built its reputation on supplying corporate machines. However, it is increasingly offering consumer-focused laptops, such as the budget-priced Toshiba Satellite Pro L300-12F (£299 inc. VAT). The chassis is made from plastic, but it's particularly thick and solid to the touch, making this a robust machine. Weighing 2.6kg, it's light enough for the occasional journey without being too much of a burden. When it comes to battery life, we recorded a life of 161 minutes. This is good, but still falls short of our three-hour target. The 15.4-inch screen has a Super-TFT coating and suffers from the same narrow brightness range. We found we needed to angle the screen back to get the sharpest image, and then found the screen to be bright with an even tone. Movies looked well-deﬁned and work documents crisp. The keyboard is a good size and sits squarely in the middle of the main body. The keys proved well ﬁxed with a reasonable typing action. You'll ﬁnd a slight curve to the keys, so you don't miss-hit when typing. The mouse buttons are small, as is the touchpad, but they have a solid feel to them and proved highly responsive. When it comes to performance, this laptop has a great speciﬁcation. It has an Intel Celeron M 550, which has a clock speed of 2GHz, and is coupled with 1024MB of memory. The 120GB hard drive is typical of this price range. We found performance to be more than acceptable, loading Windows Vista Home Premium quickly and programs smoothly. You won't be able to run the Vista Aero interface as this requires a better graphics card than the integrated Intel GMA X3100, but it's more than adequate for everyday tasks. While audio quality is basic, we found it to have some of the best speakers among its rivals, and it's certainly capable of being used for watching movies without having to add external speakers. You'll ﬁnd only the most basic connections on the sides of the chassis. With three USB ports you may ﬁnd adding external devices problematic, especially as two are close together on the left-hand side. Fortunately, the third is located on the right-hand side, making it ideal for adding an external mouse. Other ports include VGA-out, ExpressCard slot, Ethernet and modem. 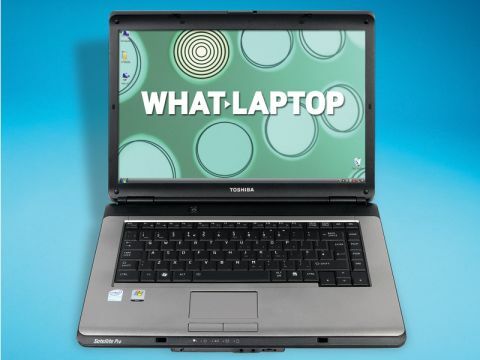 The Toshiba Satellite Pro L300-12F is a great all-round laptop for the semi-regular traveler. It offers a simple but robust design that delivers on performance and value for money.